In Dun & Bradstreet’s September Business Expectations Survey, companies are predicting weaker sales, lower employment and a decline in selling prices; however, profits and capital investment are tipped to rise in the last months of the year. The upcoming Christmas period has done little to lift spirits in the troubled Retail sector, with expectations uncharacteristically low for the December quarter. “As 2017 draws to a close, business expectations remain broadly steady, which points to ongoing moderate economic growth. Actual business activity ticked higher in the June quarter, but it remains in a range that points to the economy neither being strong nor weak, but rather something in-between,” said Dun & Bradstreet economic adviser Stephen Koukoulas. Profits and capital investment record climbs in both expectations and actuals. Sales, employment and selling prices tipped to fall in Q4. 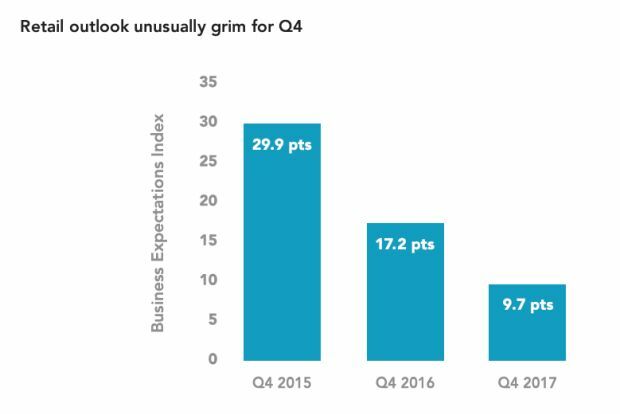 Dun & Bradstreet’s Business Expectations Index stands at 16.4 points for the December quarter of 2017, down marginally from the 16.7 points recorded in the previous quarter, and down from 17.0 points in the previous corresponding period. Expectations for capital investment for Q4 2017 have increased slightly compared to both previous and corresponding quarters. Actual capital investment activity increased sharply in Q2 2017 compared to Q1 2017. For the March quarter 2017, 16.3 per cent of businesses increased their capital expenditure, while 8.2 per cent decreased capital expenditure compared to the previous corresponding period. “One of the concerns for the economy in recent years has been the weakness in capital expenditure. Whilst expectations have been generally positive over that time, the momentum has not translated to a pick-up in activity. The current reading of expected capital expenditure is marginally above the long term average which, if realised in the second half of 2017, will be positive for actual investment,” said Mr Koukoulas. Sentiments within the retail sector remain subdued. Whilst expectations have ticked upward for the fourth quarter compared to the third quarter, the current result is substantially lower than prior corresponding quarters. 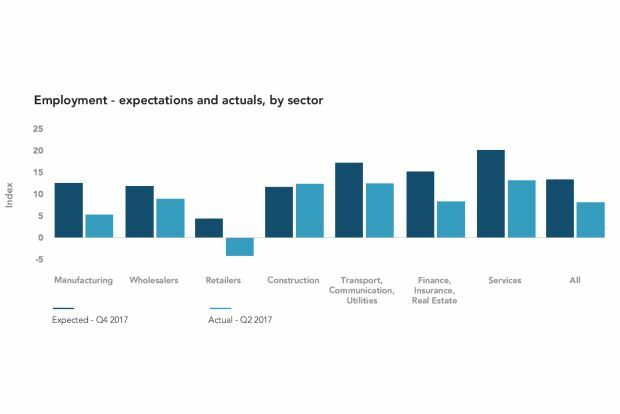 Retailers are the least upbeat about business growth across all sectors: 55.4 per cent of retail firms said they were more optimistic about business growth in the year ahead compared to the previous year, while 35.7 per cent are less optimistic. Wholesalers are the most upbeat, with 69.8 per cent feeling more optimistic compared to 20.8 per cent feeling less optimistic. Meanwhile, manufacturing firms saw a notable drop-off in optimism in the September survey, with Q4 sales, profits and capital investment expectations falling to multi-year lows. “Business expectations in manufacturing have taken a sharp turn lower, which appears to be linked to the recent strength in the Australian dollar, which is undermining the sector’s international competitiveness. Indeed, manufacturing is poised for a period of severe weakness with expected profits, sales and capital expenditure at the lowest level in at least four years,” said Mr Koukoulas. During the third quarter, manufacturers were the most likely of all sectors to say their business would benefit if the Australian dollar was lower than the current level: 17.6 per cent of manufacturing businesses would prefer a lower dollar, compared to an average of 9.7 per cent across all sectors. Actual and expected employment figures have remained largely steady. Some 21.5 per cent of executives expect to employ more staff in the fourth quarter 2017 compared to the fourth quarter 2016, while 8.1 per cent expect to decrease their staff numbers. In Q2, 20.3 per cent of businesses employed more staff than a year earlier, compared to the 12.2 per cent that reduced their employment levels. Services firms had the highest expectations for employment in the coming quarter, and the highest actual employment results for the June quarter. Retailers, on the flip side, had both the lowest employment expectation score and the lowest employment actual score. “The recent official data on employment has been particularly strong which is consistent with the previous employment expectations and actual results. 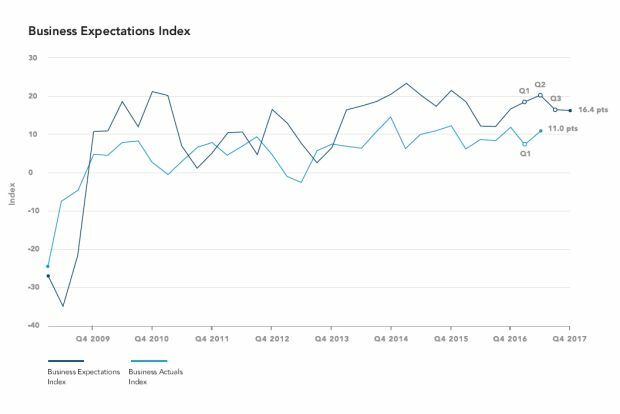 The level of employment expectations remains positive into the December quarter although there has been a small decline in the expectations index in recent months. That said, employment growth is likely to remain positive through to the end of the year,” said Mr Koukoulas.